As I noted in my previous post, several folks expressed interest in the kits that were printed with black ink, but no one was interested in the brown ink version. I decided to do some more samples so you can see the difference. Above you can see the panels that appear in the kits. They have brown ink silk screened onto natural Essex cotton/linen blend fabric. I happened to have one panel done on a piece of cream Essex which was a piece of fabric my sister had. I saved this one out to play with and have completed two of the embroideries so far. I actually like the line of the brown ink which is a little more subtle. 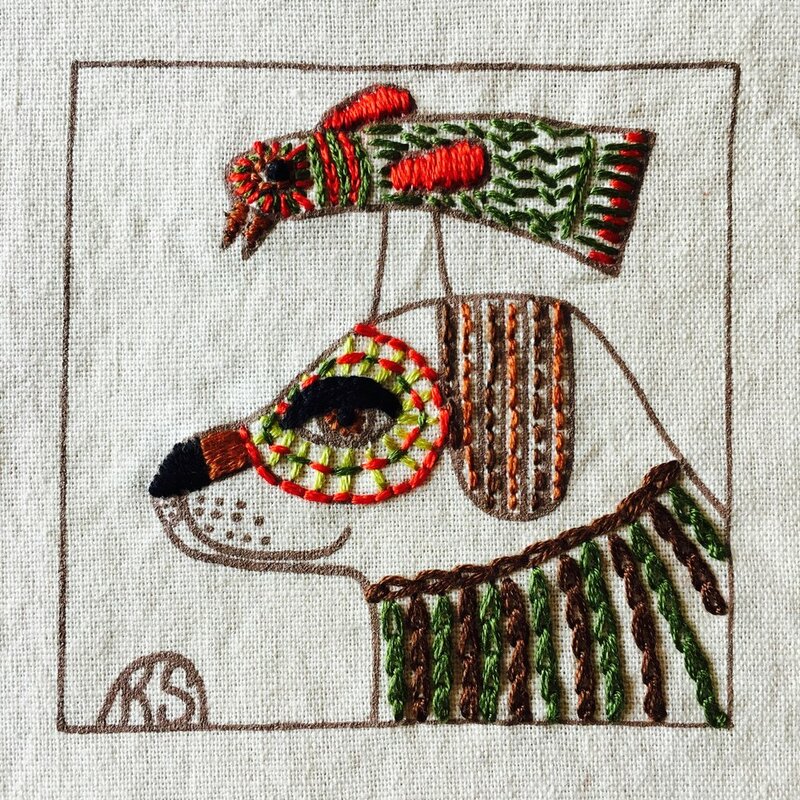 I did realize that there needed to be more definition around the eyes of the animals, so I used black french knots for the centers of the birds and dog's eye. For the cat I used the dark gray for the nose and eye lines, with a bit of black for the irises. Also, the dog looked funny with a brown nose, so I went over that with some black in a satin stitch and I did the dog's eyelid with a black split stitch. I also changed up the other colors and stitches as you see here. On the cat, my favorite part is the double petalled flowers. I did a regular lazy daisy in light gray with the light green French knot, then went around with a larger daisy stitch in the dark green. With the dog I changed the colors and did the chain stitches for his body, and a series of straight stitches and back stitches for his eye surround. As far as I know that's not a named stitch, I made it up as I went along. If you are intrigued with the kits and would like to try one at the introductory price, please see my Etsy shop listing. If you have your heart set on the black version, stay tuned. I plan to get more printed next week and will be also selling just the panels, as well as dog versions and cat versions at that time.